Dexterity, Flex, Length, Shaft will change. Dexterity, Flex, Type, Shaft will change. Dexterity, Flex, Type, Length will change. Dexterity, Type, Shaft will change. 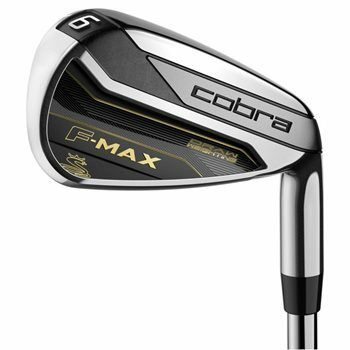 The Cobra F-Max irons feature a progressive head construction with thinner, 17-4 stainless steel in the long irons for improved speed and distance and softer, 431 stainless steel in the short irons for ultra-soft feel and precision. Launch is improved by the lower profile clubhead design while the deeper undercut creates more face flex for maximum ball speed on off center hits. Weight is strategically positioned back and heelward to promote higher launch and more forgiving, straighter ball flights and the offset hosel design generates higher trajectory with draw bias for straighter, more accurate approach shots. The nickel chrome plating provides better aesthetics and durability for great looking and longer lasting irons. These irons are great. They help me keep my shots straight with consistent distance. I did change the mid size grips to standard grips.